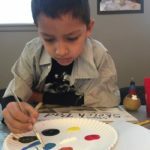 Twenty-five kindergarten-3rd graders enjoyed ARTsmart’s Spring Break ARTcamp, Folk Art Festival!, in March. 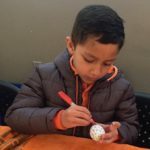 Instructor Vanessa Gonzalez prepared lessons with a focus on global folk art and students created hand painted gourds, wooden animalito sculptures, and Pysanky-inspired Easter eggs amongst dozens of other artworks for a festival of folk art fun. 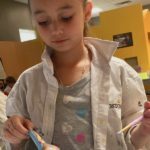 Summer ARTcamps begin June 4 and are filling up fast. 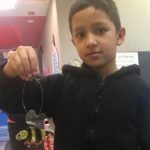 Register your K-3rd grade artists for Sculpture Factory (June 4-8), Passport to the Arts (June 11-15), Puppetry (July 9-13), Animalia (July 16-29, and Incredible Creatures (July 23-27). 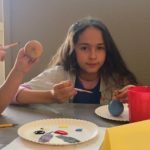 Register 3rd-6th grade artists for Creative Café (June 18-22), Classic Creators (June 25-29), Book-making/Paper-making (June 30-Aug 3), and Cartooning/Graphic Novel (Aug. 6-10). June is right around the corner and buttons (wearable tickets) are now on sale for $35 each, good for both nights, online, at ARTsmart, and at Ventana Fine Art for this popular fundraiser. Come walk and eat your way through Santa Fe’s best Canyon Road and downtown galleries and sample food from top restaurants, chefs, and caterers. 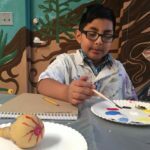 ARTsmart’s Edible Art Tour is a fundraiser that supports ARTsmart’s visual arts programming for northern New Mexico youth. The walking map is quickly filling up with art gallery and restaurant pairings, but it’s not too late to join us. If you know of an art gallery in downtown Santa Fe or on Canyon Road or a local restaurant that might like to participate, please contact ARTsmart 505-992-2787. Confirmed Canyon Road galleries and restaurants for Friday’s Edible Art Tour June 8 are: Barbara Meikle Fine art with Del Charro Saloon, Bill Hester Fine Art with The Teahouse, Bittersweet Designs with Joseph’s of Santa Fe, Gallery 901 with Floriana Catering Services, Globe Fine Art with Milad Persian Bistro, Luca Décor with Ecco Espresso and Gelato, On Canyon Consignment with El Farol, Pippin Contemporary with Jambo Café, Sage Creek Gallery with Plaza Café and Café Sonder, Ventana Fine Art with The Pink Adobe, Wiford Gallery with State Capital Kitchen, Winterowd Fine Art with Art of Chocolate, and Zaplin Lampert Gallery with Whole Hog BBQ. 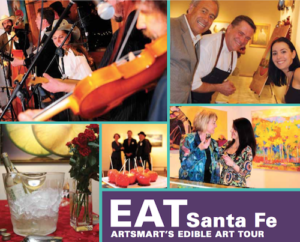 Santa Fe galleries and restaurants confirmed for Saturday’s Edible Art Tour downtown June 9 are: & Arts Gallery and Cheesemongers of Santa Fe, David Copher Studios and TerraCotta Wine Bistro, Golden Dawn & 3D Gallery and Zin Sushi, Joe Wade Fine Art and The Pantry, Little Bird at Loretto and Cowgirl BBQ, Pop Gallery and Il Piatto, Sorrel Sky Gallery and The Shed, The Torres Gallery and Sazon New World Cuisine, and Windsor Betts Art Brokerage and La Plancha de Eldorado. Don’t miss the annual Kick-Off Party at 5 pm, June 8, at Gallery 901, 555 Canyon Road, where there will be an Official Proclamation from the Office of the Mayor of Santa Fe with Councilor Signe Lindell and FREE official 2018 Edible Art Tour posters signed by artist Deborah Gold (while supplies last). Gallery 901 is hosting a special show of Deborah’s work and 10% of proceeds from sales made June 8-11 will go directly to ARTsmart. April is Volunteer Awareness Month and we need volunteers for this event. We encourage anyone who is interested in volunteering for ARTsmart’s Edible Art Tour to contact Tori: tbrown@artsmartnm.org or 992-2787. If you volunteer for one night you get a FREE button to attend the other night. This event is graciously underwritten by Gallery 901. ARTsmart’s Community Studio welcomes the first annual Salon de Santa Fe, May 4-23, in which Santa Fe Public School (SFPS) art teachers’ art is on exhibit and for sale. The opening takes place on May 4 from 5:30-7 pm in the Gallery. Please come to the “salon” and show your support for public school art teachers. This exhibition will showcase various artworks in different media including glass, prints, and pottery and has been organized by Grace Mayer and Deborah Hawthorne. Proceeds from art sales will go directly to the artists. From May 5-23 the show will be open during regular business hours Mon-Fri 10 am to 4 pm. 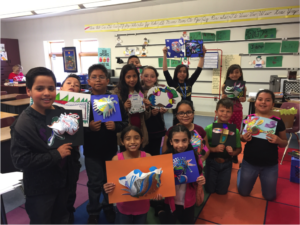 At James H. Rodriguez Elementary in Española, NM, students in Becki Trujillo’s 3rd grade class joyfully share their paper sculpture works at the end of ARTreach class. In this lesson students study concepts of dimension and transform flat drawings into three dimensional structures. The following is the second installment in the series, A Look Into ARTsmart Methodology, continued from January’s e-newsletter. This article was written by ARTsmart Program Director, Rebecca Chornenky. 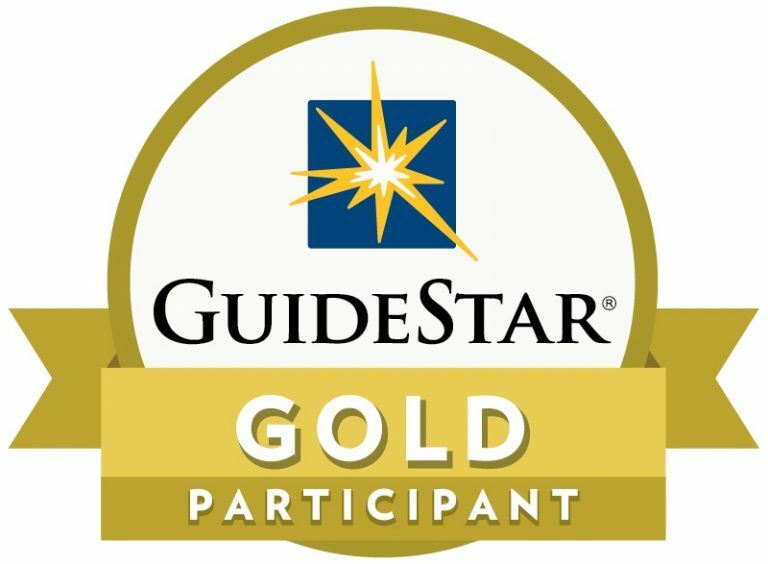 The nationally award-winning methodology used in ARTreach and ARTsmart studio classes provides a uniquely comprehensive approach to arts pedagogy by supporting students’ intellectual growth with academically rigorous curriculum while simultaneously prioritizing children’s social, emotional, and artistic growth and development. Garnering national attention, the programs utilizing this distinctive methodology were awarded the prestigious National Arts and Humanities Youth Program Award in 2010, the nation’s highest honor in arts and humanities education* for youth. The core structure of our methodology is rooted in DBAE, or Discipline-Based Arts Education, an approach to arts education that was initially developed in the 1980s by the Getty Center for Education in the Arts and has evolved over time to align with current paradigms in arts pedagogy. Making arts-related disciplines accessible to young children that were not taught previously in studio arts classes, this practice introduced art history, presentation skills, and visual literacy to the hands-on art-making process and brought context and dimension to children’s arts education. From its inception, the methodology strongly emphasized children’s personal artistic choice, long before frameworks such as TAB (Teaching for Artistic Behavior) arrived on the scene of national arts education reform. Fundamentally critical to our framework is a whole-child approach to learning. 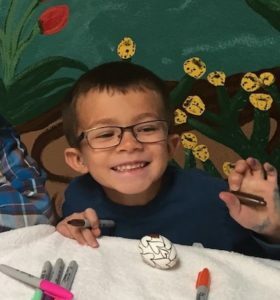 With a clear understanding that academic learning is supported by a foundation of social and emotional skills, ARTreach instructors consciously model and support children’s social and emotional development throughout the learning process—work that is increasingly validated by policy and research in the field of social and emotional learning. Hundreds of public school districts in California, as well as cities like Austin and Nashville have already introduced systemic implementation of SEL programs and developed leadership structures to support this critical element of education. 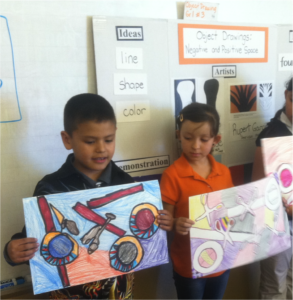 ARTreach programs are primarily known for being academically and intellectually rigorous. In every lesson, exciting concepts, vocabulary, techniques, and art historical context are introduced. 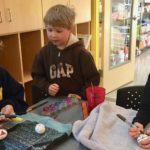 Brainstorming and design thinking processes prepare children for the hands-on art-making stage of the lesson, and students develop and expand visual and language literacy skills as they learn to talk, think, and write about art. It is during the hands-on art-making stage that students adventure into another, more hidden side of academics. This messy, experiential side is not often enough explicitly taught in academic classrooms, yet is a very real and difficult part of learning—and life. Armed with materials, new ideas, and experience gained from brainstorming techniques and games at the beginning of class, students dive in to the journey of trying something they have never tried before. 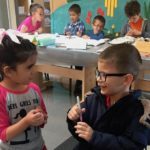 At this point, ARTsmart instructors provide active, unfaltering support and guidance on the practice of social-emotional skills necessary to succeed. It is a journey built of practice. Students practice persisting through the active struggle of making art and completing works that involve many steps, choices, and planning. They practice experiencing disappointment and trying again. They learn to practice trusting themselves, their choices, and taking creative risks. Before long, they are learning how to see the benefits of things not turning out as expected. They learn that any unwanted choice or perceived “mistake” can be claimed and transformed into a ‘happy accident,’—something even better than they initially imagined. 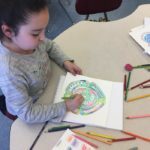 Before long, they are developing and exercising a sense of agency through the practice of making dozens of choices in the creation of each artwork. Their work, by the end of class, demonstrates proficiency in numerous concepts, techniques, and new vocabulary, and that in itself is nothing less than exhilarating to witness. If observers stop there, however, they miss a powerful part of the magic. For while the creation in an ARTreach class is assumed to be the artwork, there is a treasure of immense value that has been created in that time, and it resides within the artists themselves. 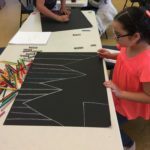 In each workshop, young artists build experience as they practice a range of social and emotional skills as vibrant and numerous as the color palettes they employ: the executive functions needed to think through their artwork from start to finish. The stress management required to be present with disappointments, the anxiety of trying something new and “not knowing how,” the vulnerability of being visible during the whole process. 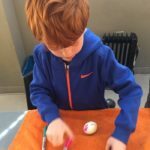 The mindfulness of noticing what their hands are doing as they press a material along a pathway on the paper, or carefully “draw” with scissors. Students practice bravery and courage—and joy!— by presenting freshly made work in front of others. They practice feeling their hearts beat faster as they introduce themselves and their work in front of the class during Artist Introduction/ Critique. They become accustomed to the feeling of being seen and being heard as they are nervous, while at the same time remaining safe. Students practice self-discipline, grit, and tenacity by not giving up at any stage of the art-making process until completion. By the end of our programs, and at the end of each class, every student takes the opportunity introduce their artwork and say with certainty: “I am an artist.” And they know it! Artwork is not the only beautiful, truthful creation at the end of class. As students work to transform the materials around them into a lively expression of something that wasn’t there before, another transformation occurs—in the students themselves. 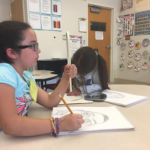 In the 2017-2018 school year, ARTsmart served 869 total students ages 5-14 through 12 to15-week ARTreach programs utilized by Espanola Public Schools and Tesuque Elementary in Santa Fe. Elementary schools such as Dixon, Abiquiu, E.T. 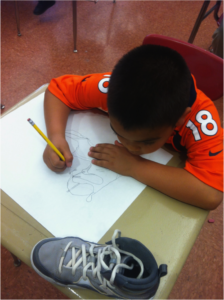 Salazar, Quintana, Hernandez, James H. Rodriguez, and Chimayo bring ARTreach programming to their schools to provide art instruction in the absence of on-site art teachers. What a gift these young artists are to New Mexico, as they practice the daring adventure of learning experientially. 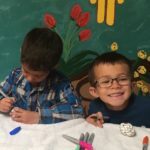 *ARTsmart programs continue the legacy of methodology and programs designed and implemented by Julia Bergen and Keelan Wackman of Fine Arts for Children and Teens. . Please see National Arts and Humanities Youth Program Awards website. 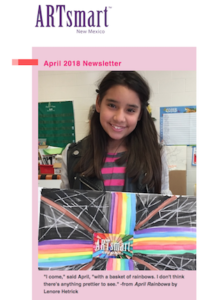 Congratulations to Faith, a 3rd grade ARTreach student, for being ARTsmart’s featured Meet the Artist for April 2018. This month we celebrate Faith’s thoughtfulness, dedication, hard work, and focus in her art practice. During the first day in ARTreach this year Faith practiced her composition skills and line types using oil pastels and black paper. CLICK HERE to view the emailed version of ARTsmart’s April 2018 Newsletter.